Light and subtle, crispy on the outside and soft in the middle lavender blackberry scones with lemon glaze! 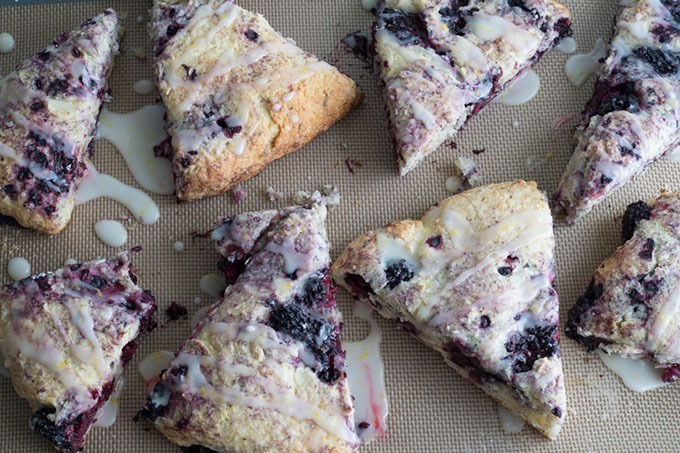 These blackberry scones are perfect for afternoon tea, bridal parties, baby showers or everyday snack! The flavour combination meshes beautifully together, to bring you a balanced little treat! 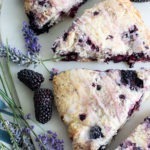 This Blackberry Scones recipe was sponsored by the Oregon Raspberry and Blackberry Commission. Thank you for supporting the brands that keep THCK up and running! All opinions are my own! Hello friends! How is your summer going so far? I hope it’s been great! Personally, this is one of the best summers I’ve had in a long time! The weather has been amazing, we’ve been on vacation, we’ve been hiking and swimming already AND all my favourite Oregon berries are in season! They are in abundance at the moment and I am loving it! We went to our local Portland Farmers Market last weekend to pick up some potatoes to make our crispy oven baked fries, and came across pints and pints of blueberries, raspberries, cherries, strawberries and blackberries! They are so fresh and so delicious and crazy cheap at the moment! I think this weekend we are going to head out to pick our own raspberries and blueberries to make jam and pies, but in the meantime, I’m busy devouring blackberries by the second! Did you know that Oregon is one of the largest producers of blackberries in the country? I sure didn’t, but I can definitely see why! The growing conditions are fantastic for blackberries here, and they are in abundance in the wild, and in berry farms around the state. From experience, Oregon blackberries are great frozen or fresh! I love that I can get fresh berries in the summer, and know that I can still whip up some of my favourites in winter, like these vanilla meringues with blackberry pinot noir sauce with frozen blackberries! Today I’ve partnered up with the Oregon Raspberry and Blackberry Commission again to bring you the most delicious, cutest little summer treat you can imagine! 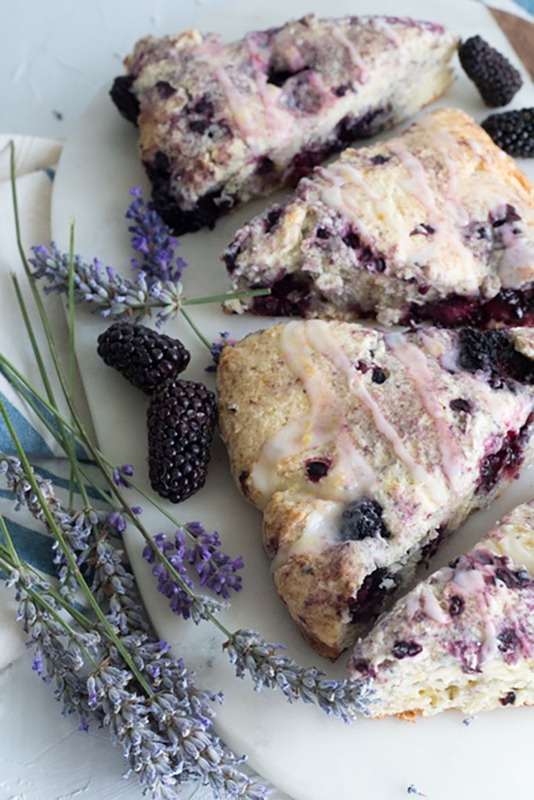 If you also didn’t know, blackberries pair beautifully with edible flowers, and for this recipe, I’ve done with a subtle lavender flavour, to take your scones to the next level! To clarify first, especially for my British and Australian friends, this recipe is for an American style scone! I go into more detail about the difference in my three ingredient lemonade scone recipe, but basically, this is going to be a slightly denser, crispier scones, compared to an Aussie scone! I have never done an American scone recipe before on THCK, so I thought this would be the perfect opportunity to try! After a couple of attempts, I have perfected the balance of flavours in these blackberry scones, and the consistency of the batter. Lavender can have a tendency to overpower a dish if you use too much, but use too little and the flavour doesn’t come out. The lavender paired with the blackberries is a combination made in heaven! The lavender is just subtle enough to taste, without leaving you with an awful floral flavour in your mouth! The blackberry and lavender are topped off with a zesty lemon glaze, that ties in the elements of sweet and sour together! One important note for this recipe is that you need to use culinary lavender. 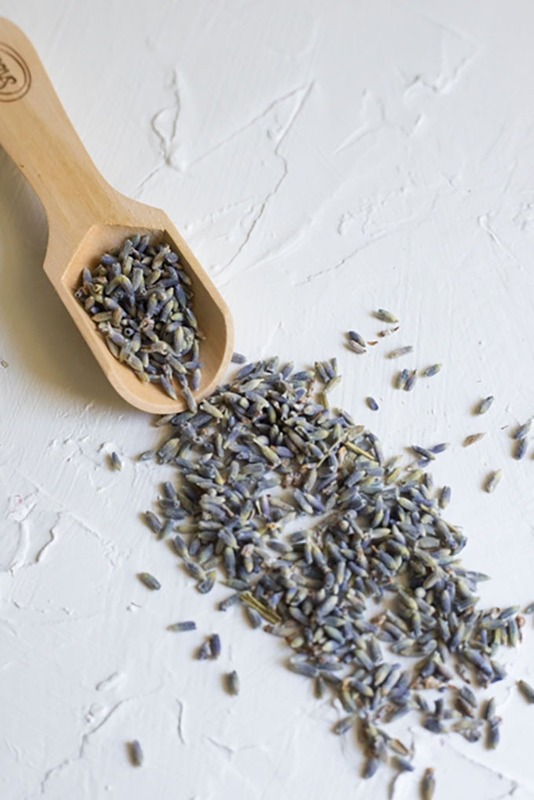 Culinary lavender is especially used in cooking and has a much sweeter, subtle flavour note with a citrus and lemon aroma to it. You can’t just go and find any old lavender in the street for this recipe! I found my culinary lavender at World Market, however a lot of spice shops should have it, or you can find culinary lavender online. A little goes a long way with culinary lavender, so the key is to start small then build up. For this particular recipe, I originally started with 1 tablespoon of the lavender. I found it ok, however, my husband, who is not a major floral fan, said it was too overpowering for him. I found that after a day, the lavender flavour had definitely strengthened. So in the end, I opted for half a tablespoon. By all means though, if you love a strong lavender flavour, I’d go for one tablespoon! Personally, I preferred the fresh blackberries over frozen blackberries. I found that the frozen blackberries leached a lot of liquid, and were really hard to stir into the batter. If you do opt for frozen blackberries, I would thaw them fully before using them, and soak up a little of the juices before adding them to your scone batter. When folding them into the mixture, it’s important to do it carefully to avoid too much breakage! 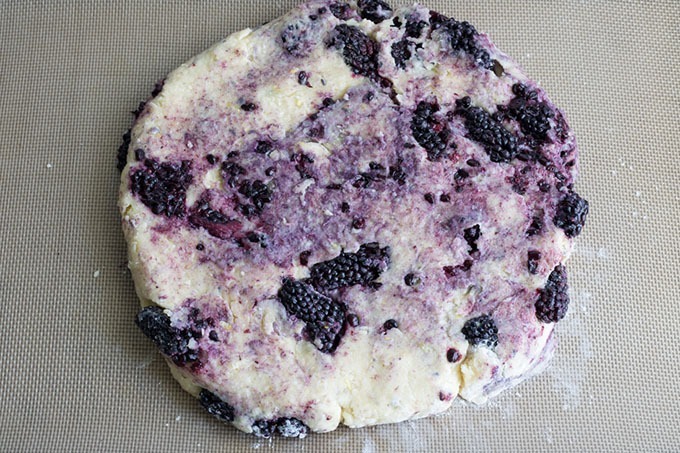 The base for the scone batter is a basic batter, with the addition of the lemon zest, blackberries and lavender. When retesting this recipe, I reduced the amount of sugar from 1/2 a cup to 1/3 of a cup, because I thought the original batch was too sweet. I also found my original batch really wet, which made folding in the blackberries very difficult, so I added another 1/4 cup of all-purpose flour. Another key to making excellent scones, is to make sure your liquid and butter are really, really cold! The best trick for the butter is to freeze it for 30 minutes or so before using it, then grating it with a cheese grater so that it combines into the dry mixture a lot better. It is so much easier to combine then working with cold butter chunks as I have previously done. In terms of liquid, many different sites will suggest using buttermilk or heavy cream, over milk. I worked with both, and found that using heavy cream made for a lighter and fluffier scone than milk, and also added a better flavour to the end product! Finally, you won’t want to over mix or overwork your scone batter. Overworking it will lead to dense scones, rather than light and fluffy. As a general rule, I make sure the wet and dry ingredients are mixed relatively well, and then just ever so slightly, and gently fold in the blackberries. When folding in the blackberries, try to make sure they are covered in batter, otherwise, you may end up with a few holes in your scones! 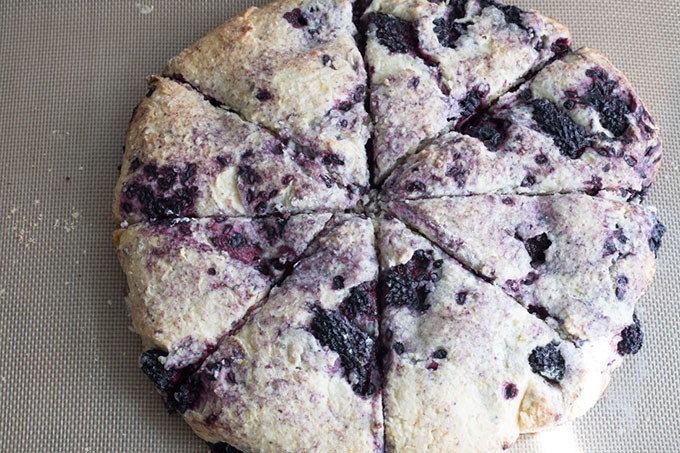 These tips and tricks will help you create the perfect, fluffy scone! These would be so great for an afternoon tea party, a bridal party, baby shower or family gatherings! They are really easy to make, and can easily be transported in a container to take to another location! I guarantee your friends and family will love the subtle flavour combination put together in these blackberry scones! So get going, and celebrate the summer time now with your fresh Oregon blackberries! 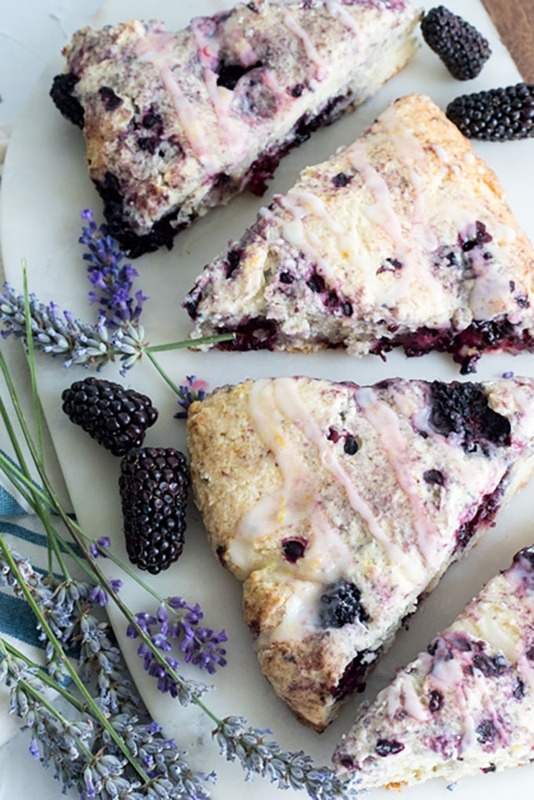 A subtle lavender and citrus flavour takes these blackberry scones to the next level! Perfectly balanced, these scones would be great for weekend entertaining, high tea or bridal parties! Whisk all-purpose flour, salt, sugar, baking powder, lemon zest and lavender together in a large bowl. Grate butter with a cheese grater, and add to the flour mixture. Use your hands to rub the butter and flour mixture together, until it resembles breadcrumbs or a course flour like almond flour. Add to the flour and butter mixture, and use a knife to gently cut the batter to mix it together. Gently use a spatula to fold in the blackberries until the dough is well combined, but be careful not to overmix the dough. Turn the dough onto your silicone mat, and shape into a round, 8"/20cm disc. The dough should be around 1.5"/4cm thick. Cut the dough into 8 equal sized triangles and gently pull them apart from each other so they don't touch. Place in the oven for 20-25minutes. They should be starting to lightly brown on the top and cooked in the middle, but still soft. Set aside to cool. Sift the powdered sugar, and combine all the glaze ingredients in a bowl. Stir together until smooth. If the mixture is too runny, add a touch more powdered sugar. If it is too thick, add a little more milk or lemon juice. Get a spoon, and drizzle the glaze over the cooled scones. I love baking with lavender! I’ve made biscotti with it, but I’ve never tried scones! I’m so jealous of you having such easy access to blackberries! that’s so cool! this was the first time I’ve baked with it, usually, I make a lavender simple syrup for cocktails! Your biscotti sounds amazing! Hi Georgie, Looking forward to making these scones. Reading the recipe I do not see how many blackberries are used. Please check and add soon…..I can hardly wait to make these it looks wonderful!!! It definitely is! I hope you enjoy the scones! These are so gorgeous! What a delicious scone recipe! Definitely a must make! What a lovely recipe for scones. You’re right this would be perfect for weekend breakfast with a big mug of steaming coffee. oh yeah! that sounds a lot like me morning today!!! 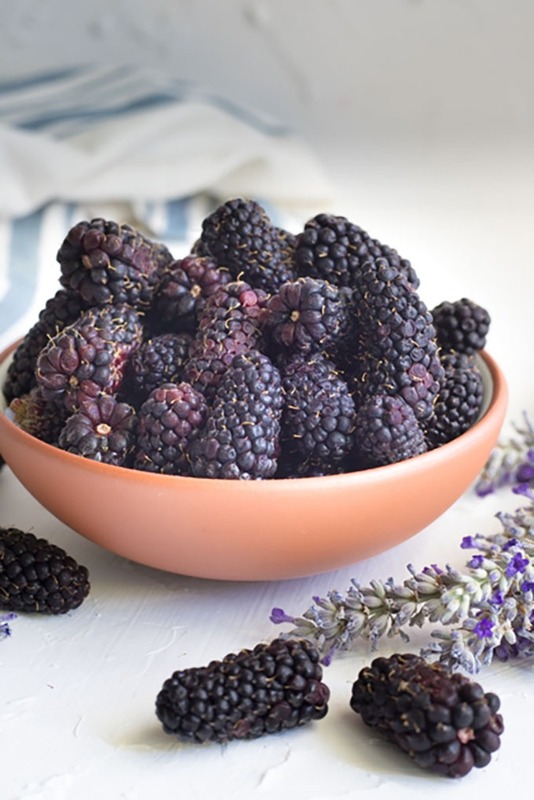 Oregon sure has some of the most delicious blackberries – AND marionberries! We had our fill when we visited – and what a fantastic idea to use them in scones! It’s been ages since I had scones – good thing its the weekend! Such a pretty recipe, and the addition of lavender is brilliant! I get nervous sometimes that the flavor will be too much, but this looks just right. I know what you mean! plus everyone’s taste buds are different! I put way too much in the first time!